If you can breathe, you can practice yoga in some form. Whatever your level of fitness or flexibility we offer a range of introductory options for everyone, along with all the foundational guidance you need to establish your practice and begin experiencing the deep-reaching benefits of yoga right away. Inviting yoga into your life welcomes a process of healing and positive transformation that extends far beyond the mat and moves through every level of your being. Over the years we’ve seen this wonderful process of transformation play out time and time again in the unique journey of our students, beginning from the very first time they roll out their mat. The profound physical benefits of yoga to every system of the body are renowned, yet the practice was designed for its similarly powerful effects at the deeper energetic, psychological and spiritual levels. So whether you’re initially drawn to the mat for physical rehabilitation, fitness or stress relief, you’ll soon become familiar with these deeper benefits as they manifest in your practice and begin to permeate throughout your life. Maybe you’ll first notice an increase in vitality, lightness of being or the familiar “bliss” effect that can tend to accompany the end of a practice. Perhaps for you it will be an enhanced clarity of mind and higher perspective. Through consistent practice you might even begin to experience a growing sense of liberation, awakening and blossoming fully into life. Wherever the path of your individual journey leads you, we’ll be there to guide and support you every step of the way. So let’s get started! Since its inception in 2005 our acclaimed Moksha Beginners Yoga Course has been the first stepping stone for so many students embarking on their endlessly rewarding journey of yoga. It’s the perfect place to start for complete beginners as well as those wanting to revisit the essential principles and establish an all-important solid foundation for their practice. Over the course of 5 consecutive weeks you’ll progressively develop a competent and well-rounded base for your practice. You’ll be astounded at the level of progress as each week’s teachings build on the last until you’re ready to confidently step into a regular practice and begin experiencing for yourself the wonderful changes yoga can bring to your life. Our Beginners Yoga classes are suited to students with little or basic yoga experience looking to develop the foundations of their practice in preparation for our regular classes. It’s also ideal for anyone seeking to practice at a steadier pace with greater guidance through the key fundamentals, while still incorporating the element of challenge to promote your development. If you’re completely new to yoga we strongly recommend the Beginners Yoga Course as your ideal first step, but if you’re yet to complete the course and wanting to get started on your yoga journey – or just to give it a try – this class will provide the high degree of guidance and support you’re looking for. 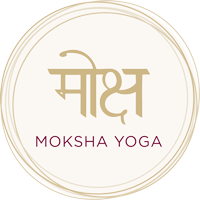 If you’re new to Moksha, let’s get to know each other! Experience the classes for yourself, get a feel for the energy of our space and individual styles of our wonderful teachers by taking advantage of our special introductory offer for new students – just $25 for 14 days unlimited access to all our yoga and meditation classes*! Expect a very warm welcome and all the guidance you need in modifying your practice to suit your individual needs. Know that your unique practice is an ever-evolving journey and that you’re joined by a family of supportive openhearted souls, so just listen to your body and take it at your own pace. Then simply roll out your mat and enjoy the experience for yourself! Comfortable, light and non-restrictive clothing, a yoga mat, a water bottle and a small towel if you wish. Yoga mats are available for hire or purchase at the studio – be sure to take advantage of our discounted yoga mat deal when you enrol in the Beginners Vinyasa Yoga Course. We’re located at 437A Centre Road, Bentleigh – above Benn’s Books and accessible via Godfrey Street. Ample parking is available behind the studio. Bentleigh Train Station is a 3 minute walk, while buses run regularly along Jasper and Centre Roads. We recommend arriving at the studio around 15 minutes prior to your class, giving you time to sign in and enjoy a few moments to relax before your practice begins. If it’s your first time you’ll just need to fill out a brief form letting us know about any health issues or injuries we need to be aware of in guiding you through your practice. Yoga should be practiced on an empty stomach so we recommend not eating for at least 2 hours prior to your class. Also aim to drink plenty of water so you’re fully hydrated for your practice. Access to experiencing the state of yoga isn’t just limited to the practice of physical postures (asana). Meditation can be one of the most effective means of achieving liberation from the cluttered layers of the mind and connecting into a space of true peace at the centre of your being. At Moksha our popular Meditation & Mindfulness Course provides the ideal introduction and guidance to establishing your own liberating practice, while our regular group Meditation & Mindfulness Classes are the perfect companion to your physical yoga practice for those looking to move deeper.